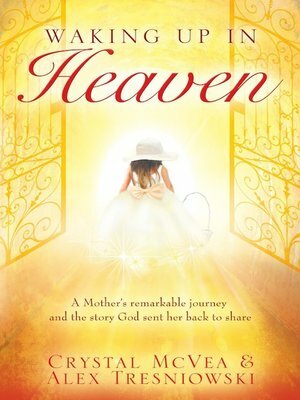 Waking Up in Heaven tells the remarkable story of a woman, plagued with guiltand skepticism, dramatically changed by the nine minutes she spent in heaven.For most of her life, Crystal McVea was a skeptic whose history of abuse and badchoices made her feel beyond the reach of God. She questioned if God was evenreal. Then came 10 December 2009 and the moment that changed everything.For nine minutes that night, Crystal went into full respiratory arrest. She wasunconscious and unable to breathe on her own, unaware of the crisis happeningaround her as the hospital staff rushed to save her life. Crystal doesn't rememberthe trauma or losing consciousness; she just remembers waking up in heaven,next to God. Crystal discusses some of the extraordinary things she encounteredin heaven, including the beautiful gates of heaven, our guardian angels and a lifealteringvision of her younger self.Waking Up in Heaven invites readers to witness the relentless pursuit of God ina life that was broken and seemingly beyond hope, an awe-inspiring account oflove, forgiveness and redemption and the healing power of God's presence.